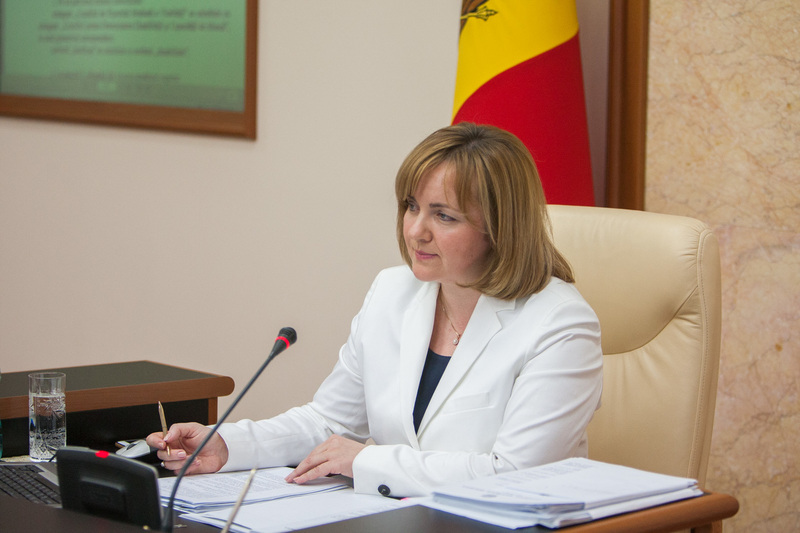 Ambassador Natalia Gherman has led a distinguished diplomatic career, having served as Minister of Foreign Affairs, Deputy Prime Minister, and Acting Prime Minister of the Republic of Moldova. Among her accomplishments, she was Chief Negotiator on the Moldova–EU Association Agreement, and she also led in negotiations which resulted in Moldova being the first Eastern European country to establish a visa-free regime with the European Union. Now, she is an official candidate in the 2016 United Nations Secretary-General selection. You would be the first United Nations (UN) Secretary-General (SG) who is female, the first SG from your region, Eastern Europe, and the first from your country, Moldova. How would this background influence your agenda and leadership as United Nations Secretary General? If I am to be the first woman and the first Eastern European as the UN Secretary General, it will be, above all, a great honor for me! I will approach the job with utmost responsibility to deliver on the expectations of the world’s citizens. The UN from my point of view still remains to be the best expression of commitment of humanity for collective action for better living for all the citizens of the world. It’s important that the selection process for the SG of the UN is based on meritocracy and professionalism, as well as on real gender balance and fair geographical representation. If I am the first woman on the job, then it will be proof of our commitment to real gender equality. The UN should lead the Member States and other organizations by this good example. In the 70 years of the UN’s existence, there has never been a female SG, nor was there a SG from Eastern Europe. It’s our region’s turn to present a professional, competent candidate. The principal of geographical rotation, even if it is not written, has been duly respected in all those years by the broader membership of the organization, so I think it will be only fair to expect the next SG to be from Eastern Europe. Our region deserves it—in the last 25 years we’ve been showing by example that change is possible: for our countries, for our peoples, for our institutions. We became young, developing democracies due to the historical transformations that engulfed our region about two decades ago. We proved by our own example that it is possible to build democratic, functional states from scratch, building the institutions that serve the citizens in an accountable manner, transforming our economies from centrally-planned to market-oriented economies, and putting human rights and human dignity at the center of all our policies. 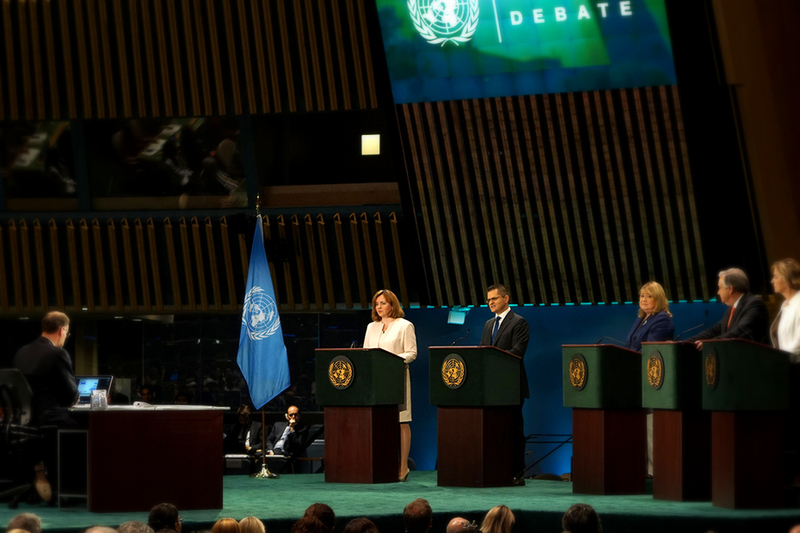 We did this, we developed the most important standards, we learned how to respect the values and principles enshrined in the Charter of the UN, and we stand very firmly for democracy, freedom, and dignity. I think this is the right time that one of us from Eastern Europe leads the United Nations organization. As UN SG, how would you ensure that all minorities—not only gender but also religious, ethnic, sexual, linguistic, and others—are protected under the auspices of the UN? Whether we are talking about peace, or about sustainable development, we will be guided by an all-embracive slogan: we will leave no one behind. Leaving no one behind means including, informing, and empowering all the categories of people in our society to feel ownership over processes that are important for them. Neither peace nor progress is sustainable in the absence of basic human rights. Therefore, I am determined to ensure that the respect of human rights is at the core of UN activities and programs. I will put people at the heart of all our actions, and would aim to protect and ensure the rights of absolutely all categories of people represented in our societies. I am determined to advocate for the inclusiveness and indivisibility of human rights, starting of course with the right to peaceful existence, to education, to access to health services, to employment opportunities, access to representation. For example, I would ensure that development programs are designed so that policymakers and practitioners put the lives of absolutely all categories of persons at the core of planning processes. It’s also very important that when we mediate or negotiate the peace processes in different parts and different regions of the world, we have to guarantee the voice of the minorities at the negotiation table so that peace efforts really become sustainable. Moldova is the only country from the Eastern Partnership which has a visa-free regime with the EU. At the same time, given its history, Moldova has traditional ties with the countries from the former Soviet Union, including Russia. How could this background—being part of the East and experience in dealing with the West—help you as a SG to deal with the current challenges in the relationships between the West and Russia? As Foreign Minister of Moldova, I had only diplomacy and dialogue on which I could rely as I helped my small nation establish a place for itself in global affairs. I like to think we were successful. I know firsthand the risks that geopolitical tensions pose to developing democracies. My perspective is unique and allows me to identify where the common ground exists between parties when others can only see the differences that keep them apart. I believe I demonstrated this ability while playing a role in the extremely complicated issue of Transnistria, which presents many of the typical features of intractable conflicts compounded with a geopolitical dimension. While negotiating on behalf of my country in this issue, I also negotiated the EU-Moldova Association Agreement. The international community needs to continue finding common ground if we aim to tackle the challenges of growing inequality, extreme poverty, failing state institutions, lack of good governance, and various humanitarian crises. My experience at the national level has provided me with the direct experience in tackling most of these questions. The UN Sustainable Development Goals (SDGs) proposed an ambitious development agenda. However, you have strongly expressed your intention to prioritize SDG 16. Why are you highlighting this goal, and what specific steps would you take to support member states in fighting corruption and ensuring rule of law? I specifically indicated in my Vision Statement when I became a candidate for UN SG that I would tackle the implementation of the SDG agenda in a holistic, all-embracive way, but that I would try to focus the implementation effort through the prism of Goal 16, which calls for Institutions at the Service of Citizens, Rule of Law, and Good Governance. I firmly believe there will be no eradication of poverty, no sustainable effort to ensure quality education, health, mitigating the effects of climate change, or empowerment of women, if we do not approach all those goals through the point of view of rule of law, good governance, and eradication of corruption from all levels of our societies. In fact, I contributed to formulation of Goal 16 since, for the past 2 years. I conducted inter-governmental consultations at the global level on articulating the substance and the contents of Goal 16, culminating in Chisinau, when we hosted the UN global meeting on responsible institutions and rule of law. The Chisinau Declaration, the outcome of this meeting, was an important contribution to what is now Goal 16. It of course will have to start with the UN, which should lead by example and demonstrate a model for Member States to follow. If I’m the next SG, I will make sure that a zero-tolerance policy is applied to waste, mismanagement, abuse, and corruption inside the UN organization. For that particular purpose, I would make sure that there is a very strong internal oversight department inside the Secretariat of the UN, and there is a proper awareness campaign conducted throughout the UN system. I’m planning to also establish a Focal Point on Corruption within the system, and introduce very tough disciplinary measures in cases of corruption detected in the system—I know very well how to detect corruption, having experience from my national environment. For our long-term vision, I would aim to domesticate this agenda in national environments. Unfortunately, no society is immune from that scourge, but it takes a clear experience and ability to identify it and fight against it. Here the attitude of the citizens, the people, is of great help, because if it starts at the grassroots level, then you can rely on the assistance of all the stakeholders. From there, I believe it is about best practices and lessons learned that need to be broadly shared throughout the UN membership. It’s about the legislative framework which works best in many of our countries. It’s about those countries who have advanced on this issue sharing experience and expertise with those who are still struggling, and about making sure that the UN works as the best catalytical platform for such efforts at the service of the Member States themselves. More needs to be done, but I’m absolutely sure that change is possible even in this very challenging area. Rule of law and good governance are challenging for all of our countries. I can only reiterate that without placing overwhelming importance on rule of law, it could be much more difficult to progress on all other areas. Many of the problems we face, like climate change and international migration flows, transcend borders and demand international response and cooperation. How would you better encourage, motivate, and incentivize Member States to meet their respective responsibilities in addressing global challenges? The SG of the UN is first and foremost the guardian of the Charter of the UN—the values and principles still as valued today as they were at the moment of creation of the organization—and it is of paramount importance for the SG to advocate for those values continuously by addressing the Member States. First of all, I would advocate in favor of stronger implementation of a lot of international agreements and instruments that have been created and have been inspired by the provisions of the Charter. In this particular field, I believe in the power of persuasion and diplomacy. I would demonstrate that solving global challenges will be a win-win situation for everybody, starting with governments and then making sure that partnership with the civil society and private sector will benefit those standards of norms of the international provisions as well. I would work even harder on consolidating those partnerships with governments, but also create better partnerships with the civil societies in each Member State and with the international financial institutions who are our traditional partners. We especially need to work closer with the private sector, which ultimately brings us additional resources to obtain our goals. They also bring technology and they bring innovation, and I want very much for the UN to be open to positive transformation and innovation. I also think we have to be much more clear and well-structured with consolidating partnerships with regional organizations. They are the best partners of the UN, and it has to be a relationship based on complementarity, not fragmentation. If asked and motivated by the UN, these sectors can focus on such important issues facing us as global pandemics, refugee crises, global migration, and even the specific situations in the most vulnerable and fragile states. I think we can forge such partnerships for the next years to come, and unite all the efforts globally to attain our common objectives. You have now been active in diplomacy for over 2 decades. Based on your 25 years of experience, what trends and changes do you foresee in the next 2 decades to come? We all recognize nowadays that, this time, we don’t have any right to fail on implementing the tasks we set for ourselves, particularly last year when the historical agreements on climate change and Agenda 2030 for Sustainable Development were concluded by the members of the UN. That understanding—that we don’t have the right to fail because future generations expect us to succeed and provide a better life for them—must motivate us in the next 2 decades to come. I am sure that this understanding will motivate all of us to engage in this common endeavor. Learn more about Ambassador Gherman’s campaign at 1For7Billion. Follow Ambassador Gherman on Twitter. PASS is currently cooperating with Ambassador Gherman’s campaign on a voluntary, pro-bono basis. No Replies to "UN SECRETARY-GENERAL CANDIDATE NATALIA GHERMAN"